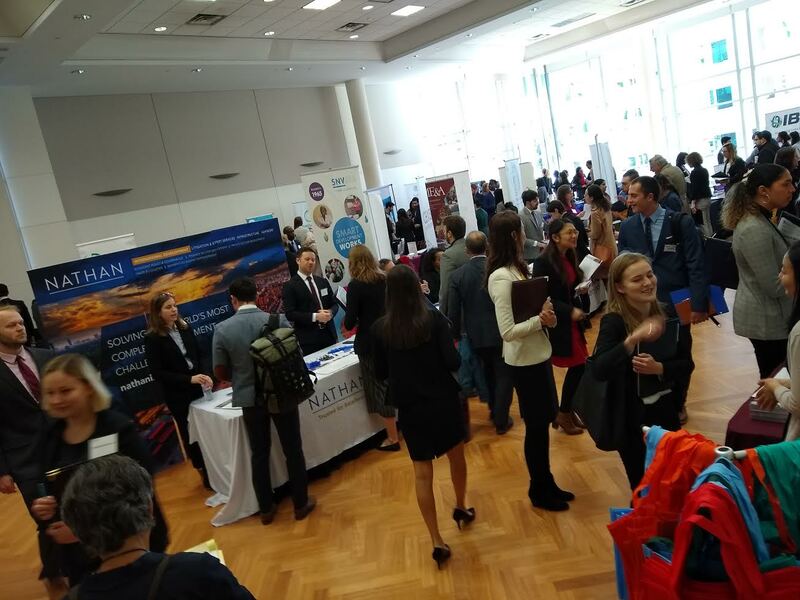 Yesterday (1/31/19), the Society for International Development, Washington Chapter (SID-W) held it’s annual Career Fair at George Washington University. I’ve attended in the past, and found the event informative of hiring trends and areas in which recently minted graduates and career changers might search for their next opportunities. Considering the frigid weather in DC, I was impressed with the turnout. I would guess at least 500 mostly millennials dressed in business wear passing out resumes were in attendance. As a career coach, visiting the exhibits and talking with employers allows me to gauge hiring. My own clients tend to be interested in international development, humanitarian, conflict resolution, and government related careers. I will also be teaching a career intensive seminar at the School for Conflict Analysis and Resolution at George Mason University in a few weeks, so this was homework for me! At the end of the this post, I will list the organizations attending and provide links to their human resources or employment pages. I had a chance to meet Julie Montgomery , the director of membership of SID-W. I also had a chance to be interviewed for the website. Currently, SID-W is offering specials on membership, which would be a valuable investment for a young professional. What areas are you seeing a need for hires at your NGO or organization? Finally, I will often ask the person I talking with “how did they get into the field”? Getting a personal story can be inspiring and can lead a potential job searcher to new strategies. In addition to speaking with employers, I attended one of two panel sessions. The one I attended was “The Next Generation Professional” and featured Kerry Bruce (Clear Outcomes), Krista Baptista (DAI), Nick Martin (TechChange), and Kate Warren (Devex). What did I learn? It seemed overall that hiring was strong, with larger development groups like Chemonics and DAI having more openings. Many of the groups there were USAID contractors and with the shutdown over and a general shift to contractors over direct hires right now, there seems to be much available. But there were some small groups present also. I was impressed with Panagora Group, a women owned start up based in Silver Spring, Maryland. As has been the trend in recent years, there is a need for staff with technical and M&E (monitoring and evaluation) backgrounds. As for tech, knowing how to integrate technology and use it across your work was important. You don’t need to be a coder or have a degree in IT. This was emphasized during the panel by Nick Martin. (He shared about his own degrees in poetry and peace education – not a likely entry to his work today!). For most groups jobs tended to be divided between home office – usually DC – and in the field. Many home staff never get into the field, and increasingly the local field staff are nationals (not Americans). If you do desire a field position, you need to make that clear and seek out international experiences. Kerry Bruce stressed asking for what you want. The chances of you getting a field position are improved if you have foreign language and have had overseas experiences. Many of the staff I talked with had had Peace Corps and similar experiences. By and large most of the attendees at the event were master’s students. In DC, the master’s degree is the new bachelor’s. This is maybe hard to accept for those who don’t have a master’s, but increasingly even entry level administrative positions are going to master’s students. I actually think that is a bad trend in that master’s students are likely to move on more quickly than bachelors’ students. If you don’t have a master’s, but have extensive overseas experience (e.g., Peace Corps, Fulbright, etc.) then you are still competitive. Intersectionality is important today. Kate Warren talked about being an integrator rather than a specialist or generalist. This new mindset requires extensive soft skills such as collaboration and the ability to see the connections between fields. This is a similar concept as the author Daniel Pink’s “boundary crossers” which I mention in my book Peace Jobs: A Student’s Guide to Starting a Career Working for Peace (IAP 2016). Nick Martin and other panelists emphasized the need for life long learning. Nick’s firm, TechChange, offers online courses for those working in myriad international fields. Kate Warren shared some findings from a report (a must read for all DC based career coaches!) that Devex published that looked at changes in the field. These changes have ramifications for careers. One interesting point is the increasing collaboration between the private and public sectors. This is allowing for different kinds of funders including more corporate based and venture capital. Having a funding background could be an important career booster. Another finding was that climate change is affecting all facets of the development field. Finally, soft skills are going to be increasingly important including the ability to collaborate, adapt, and show empathy. Krista Baptista and others emphasized curiosity as an important soft skill. This often equates to a passion or calling for some in the field. With the environment changing so rapidly, the ability to adapt and see the future is critical. In talking with employers, I was struck by the commitment that many have to this work. Development professionals (and I would say those in all global “helping” fields) have a deep and abiding commitment to social change. This is also a small and connected community. My son Lorenzo Choudhary- Smith recently returned from Peace Corps service in Namibia. I was at PLAN International and talked to the recruiter. She shared that she had just gotten back from Peace Corps in Namibia. What? That is where my son was! And yes… they knew each other! Shaylyn Stanley was a health worker; my son was a teacher. Small world for sure. Finally, going to event like this is critical to a career strategy. Notwithstanding the weather, students came out. I was disappointed though, I did not see more of my own students, but I did see one, Ruba Hindi who has a master’s from S-CAR. I was glad to see her! David J. Smith is a career coach, speaker and consultant based in Rockville, Maryland, USA. He is the author of Peace Jobs: A Student’s Guide to Starting a Career Working for Peace (IAP 2016). He is an official member of Forbes Coaches Council and member of the PCDN Career Advisory Board. David is also the president of the Forage Center for Peacebuilding and Humanitarian Education, Inc. and teaches at School for Conflict Analysis and Resolution at George Mason University and the School of Education at Drexel University. He can be reached at davidjsmith@davidjsmithconsulting.com. Below are links to the groups in attendance. In most cases, I linked to the jobs or careers page. I had a very good time yesterday at the SDI career fair having a chance meeting all big large development groups NGOs, hoping to land a job. Some recruiters were positive and others weren’t. It it seems that my lack of not working with USAID contractors may prevent me of getting the job I want. Overall it was a greet experience and it was nice seeing you there my professor and coach. This is an invaluable resource. Thank you so much David for putting this together. Done wonderfully!